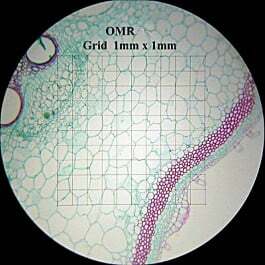 The OM36-B is the binocular version of the OM136-C and is a classic compound microscope that has been a best seller for over 10 years. The binocular head is inclined at an ergonomic 30° and rotates 360°. Standard features include WF10x (23mm) eyepieces and dual diopters on the oculars for convenient, individual eye focusing. There are four, coated, parfocal, parcentered achromatic objectives: 4x, 10x, 40xS and 100xS oil immersion for magnification settings of 40x, 100x, 400x and 1,000x. The objectives are set in a quadruple click stop, rear-facing nosepiece that enables more convenient slide handling. 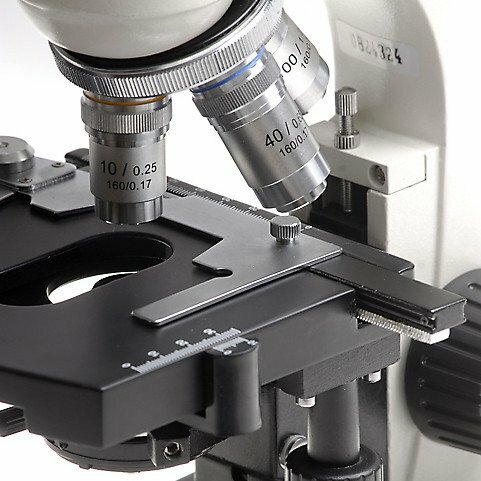 Rack and pinion focusing with coaxial coarse/fine focus controls make it easier to focus while a slip clutch and rack stop combine to prevent slide or microscope damage. The graduated mechanical stage measures 125mm x 110mm with drop-down, right hand coaxial controls. The range of movement is 30mm x 70mm. 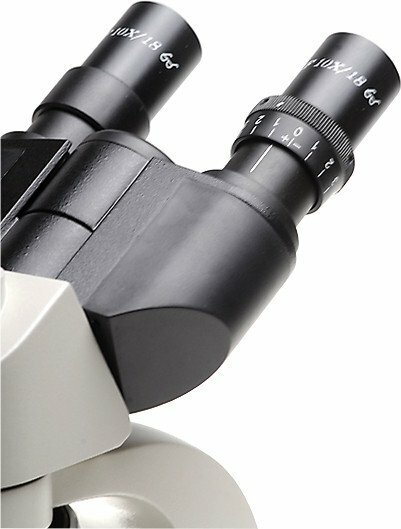 The microscope also includes a professional 1.25 N.A Abbe condenser with iris diaphragm and filter holder for ideal light control. Illumination is available in either 6V 20W halogen or rechargeable LED, both with variable control. Accessories include blue filter, head adjustment tool, dust cover and manual. The Omano OM-36-L is the rechargeable LED version of the OM-36B that, once charged, can be used in the field without the need for a power supply. One charge lasts all day. 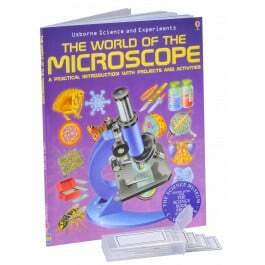 It is a classic compound microscope that has been a best seller for over 10 years. The objectives are set in a quadruple click stop, rear-facing nosepiece that enables more convenient slide handling. Rack and pinion focusing with coaxial coarse/fine focus controls make it easier to focus while a slip clutch and rack stop combine to prevent slide or microscope damage. The graduated mechanical stage measures 125mm x 110mm with drop-down, right hand coaxial controls. The range of movement is 30mm x 70mm. 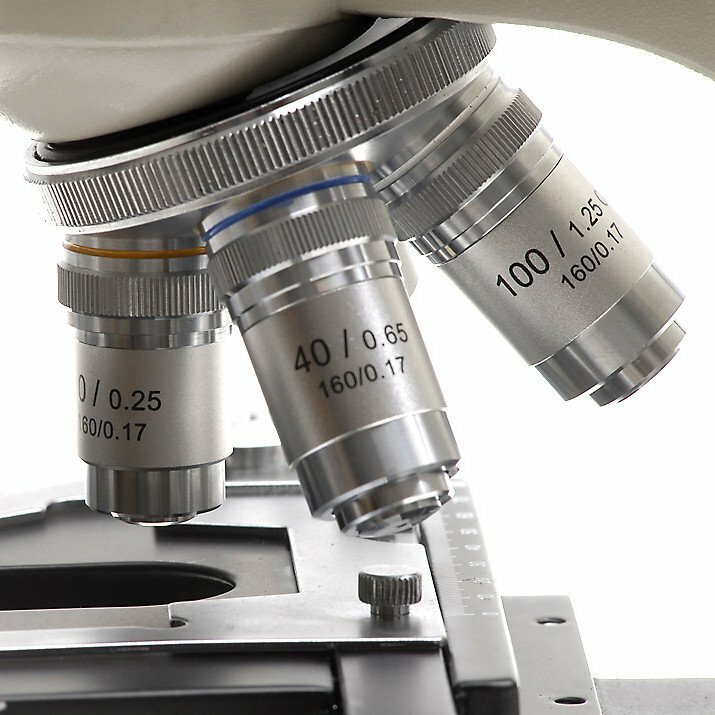 The microscope also includes a professional 1.25 N.A Abbe condenser with iris diaphragm and filter holder for ideal light control. 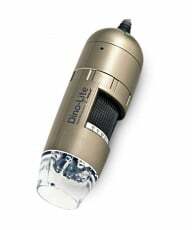 Illumination is rechargeable LED, both with variable control so the microscope can be easily carried in the field without need for a power source. This is the trinocular version of the OM36B binocular microscope for use with a camera. Simply place the camera in the trinocular port. 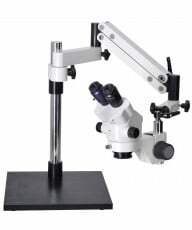 The Seidentopf microscope head is inclined at an ergonomic 30° and rotates 360° for easy sharing. Standard features that include WF10x (23mm) eyepieces and dual diopters on the oculars for individual eye focusing. There are four, coated, parfocal, parcentered achromatic objectives: 4x, 10x, 40xS and 100xS oil immersion for magnification settings of 40x, 100x, 400x and 1,000x. The objectives are set in a quadruple click stop, rear-facing nosepiece that enables more convenient slide handling. Rack and pinion focusing with coaxial coarse/fine focus controls make it easier to focus while a slip clutch and rack stop combine to prevent slide or microscope damage. The graduated mechanical stage measures 125mm x 110mm with drop-down, right hand coaxial controls. The range of movement is 30mm x 70mm. 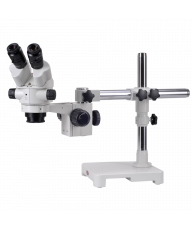 The microscope also includes a professional 1.25 N.A Abbe condenser with iris diaphragm and filter holder for ideal light control. Illumination is available in either 6V 20W halogen or rechargeable LED, both with variable control. Accessories include blue filter, head adjustment tool, dust cover and manual. Lifetime Limited Warranty. 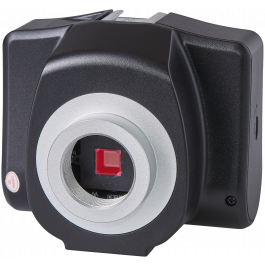 This is the trinocular version of the OM36 and provides LED illumination and a trinocular output for easy mounting of a microscope camera. The trinocular head is inclined at an ergonomic 30° and rotates 360°. Standard features that include WF10x (23mm) eyepieces and dual diopters on the oculars for individual eye focusing. There are four, coated, parfocal, parcentered achromatic objectives: 4x, 10x, 40xS and 100xS oil immersion for magnification settings of 40x, 100x, 400x and 1,000x. The objectives are set in a quadruple click stop, rear-facing nosepiece that enables more convenient slide handling. Rack and pinion focusing with coaxial coarse/fine focus controls make it easier to focus while a slip clutch and rack stop combine to prevent slide or microscope damage. The graduated mechanical stage measures 125mm x 110mm with drop-down, right hand coaxial controls.The range of movement is 30mm x 70mm. 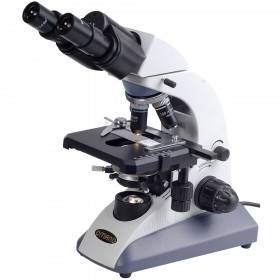 The microscope also includes a professional 1.25 N.A Abbe condenser with iris diaphragm and filter holder for ideal light control. Rechargeable LED illumination, with variable control. Accessories include blue filter, head adjustment tool, dust cover and manual. Lifetime Limited Warranty. 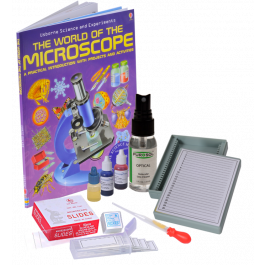 One of our most popular microscope accessory kits now includes a Slide Kit, 15 Prepared Animal Slides and the book, "The World of the Microscope". 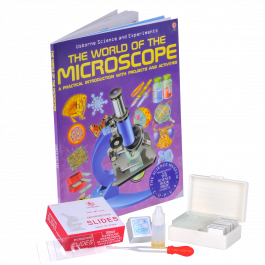 This microscope slide kit (OMSK-15A) contains a mix of 15 prepared animal slides in a durable plastic case. The selection of specimens are professionally stained and carefully mounted on glass slides with cover slips. Each slide is labeled and conveniently arranged in the plastic case. 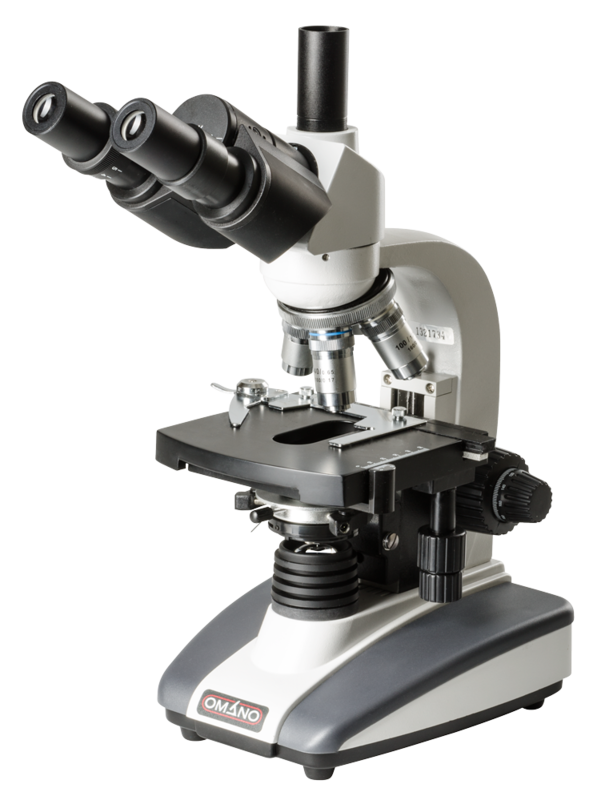 The OM36 compound microscope has been a perennial favorite of our customers and for good reason. 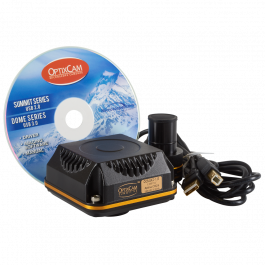 Available in binocular or trinocular format and with either halogen or rechargeable LED illumination, it offers good quality optics, a host of professional features and solid industrial design. 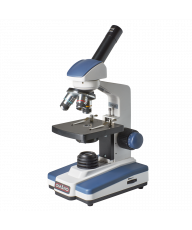 It is a classic, affordable Omano compound microscope that has proven popular with Middle Schools through Medical Schools. The LED version is portable and can be used in the field; one charge lasts all day. Four rear-facing objectives, an integrated, double-layered mechanical stage and halogen or LED illumination combine with excellent design and construction to make an enduring microscope that is simply better quality than the OM118 series. Unsurprisingly, it is backed by an Omano lifetime limited warranty. 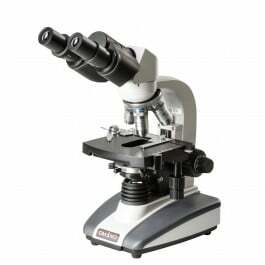 The OM36 includes a binocular or trinocular Seidentopf microscope head inclined at an ergonomic 45 degrees. The head rotates 360 degrees for flexible viewing positions and includes two Wide Field WF10x eyepieces and rubber eyecups for improved viewing. The oculars both have diopters that enable individual eye focusing while the head can be adjusted through 55-75mm to adapt for different interpupillary distances. The OM36 features a rear facing quadruple nosepiece with four parcentered, coated, parfocal, 185mm achromatic objectives (4x, 10x, 40x spring, 100x spring, oil immersion). Both the 40x and 100x objectives are spring-loaded to mitigate the risk of damage on the slide. Magnification levels include 40x, 100x, 400x and 1,000x unless optional higher power eyepieces are used. A 23mm camera adapter is included with the trinocular version. The OM36 series includes an oversize double-layered, graduated mechanical stage that measures 110mm x 120mm. The range of X-Y movement is 70mm x 25mm and the stage includes a spring-loaded slide clamp for exact positioning of the specimen. The stage is controlled by convenient dropdown, coaxial coarse/fine controls so the viewer can operate the stage 'eyes down'. The condenser is a professional Abbe 1.25 N. A with iris diaphragm for optimal adjustments. Transmitted 6V 20W halogen or LED illumination includes variable intensity. 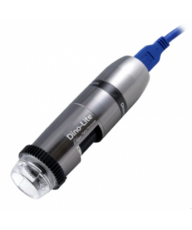 The LED version requires one 30 minute charge to be used out in the field all day long. Shipping weight and dimensions: 12lb. 17"x13"x9"